Quantum Linguistics as a term sounds quite intimidating but in actual fact, is quite simple. It is referring to the multidimensional aspect of our thought processes and how that multidimensionality is represented to the outside world through our language. NLP takes advantage of this multidimensionality in order to assist people to understand and see past their problems. The nuts and bolts of it are that as you look at this page on your internet device, there is this internet device and everything else in your environment is not the internet device. If you are sitting down, then there is a chair and there is also not a chair, in that the air around the chair is not the chair. Language has defined and put boundaries around what exactly is the chair hasn’t it? Now, it is simple to understand in terms of an object what is the object and what is not the object. It is somewhat more complicated in terms of concepts to understand what is part of the concept and what is not part of the concept. When someone states that they have a problem, we need to establish what exactly in someones life is the problem, and what is not the problem. We need to establish where the boundaries of the problem are, as this may not at first be apparent. 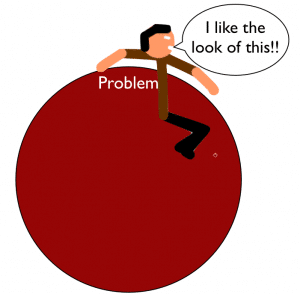 Once we have established where the boundaries of the problem exist, then we can take another person past the boundaries of their problem in their thinking. By doing that you enable someone to see outside of their problem and in many cases this results in the problem disappearing. All of these subjects and processes are part of Excellence Assured NLP Master Practitioner Training Courses.